Looking for unique furniture? Here’s a collection that will certainly perk up any space. From 3D printed desks to chairs made from basalt rocks, the furniture in this post will give you new perspectives on seating and storage! A sofa that will bring out your inner child! 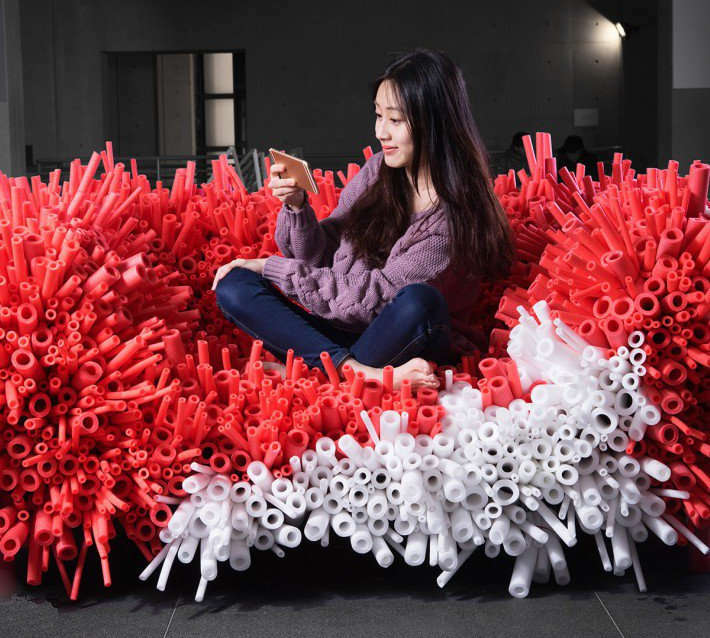 Called the Anemone, this award-winning seating by Yi Xuan Lee is made from tying red and white polyurethane tubes with red wires to resemble a sea anemone. The tubes’ varied diameters provide visual texture and look uncannily like the real thing. For all the fans of Finding Nemo, this sofa is for you! 3D printed furniture with a fresh look. 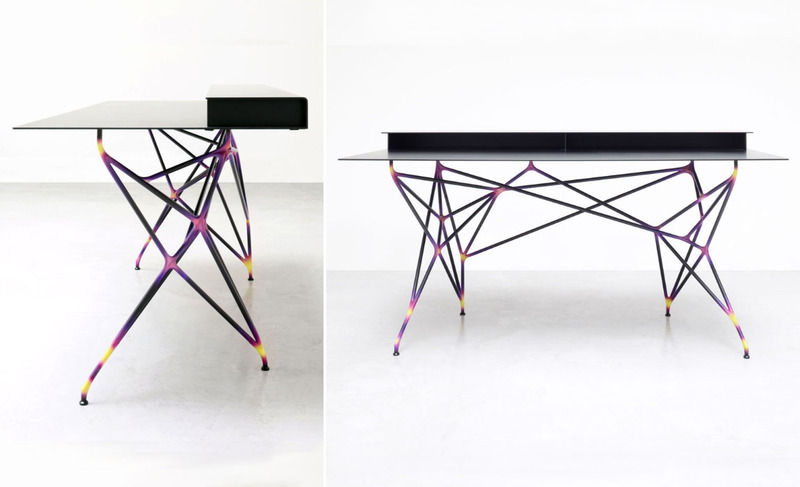 Designers Reed Kram and Clemens Weisshaar made a splash with this minimalist desk and hutch, which touts multi-colored 3D printed aluminum joints, high tensile strength steel tubular legs and a powder coated aluminum desk top. The MultiThread furniture collection also includes a side table, coffee table and book shelf. Seating to play peek-a-boo in! 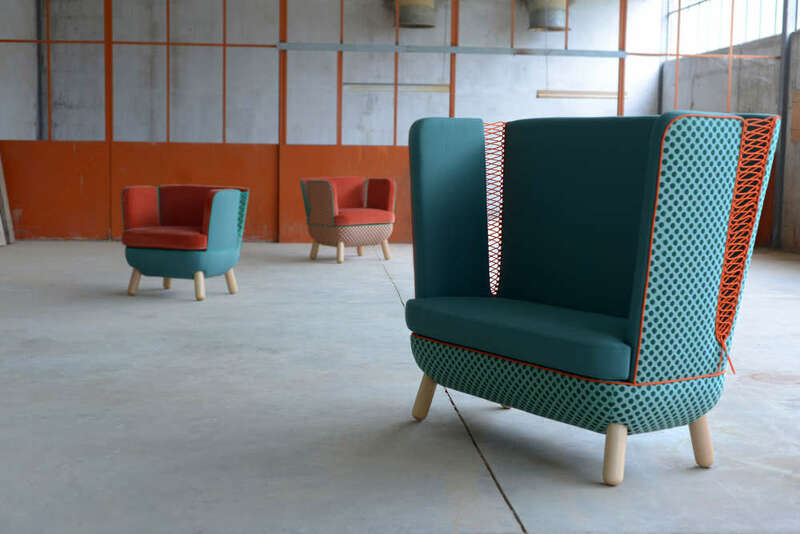 Italian furniture maker Adrenalina’s Sly collection might as easily have been called Peek-A-Boo. The chairs and sofas, available in high and low back versions, reveal tantalizing views of their occupants through the colorful lace-ups between the sides and back. Eye popping colors and patterns in a variety of materials, including velvets and wools, are available to spice up the scene! A piece of furniture that honors its local roots. 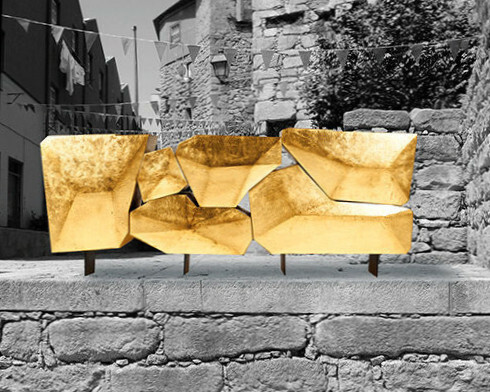 Porto designer Marco Sousa highlights the charms of his hometown river with the Stone sideboard. Loosely translated as ‘River of Gold’, the Rio Douro is known to shimmer like liquid gold as it flows over its granite boulders in the setting sun. The gilded storage cabinet has 6 compartments lined with blue satin and lacquered matte black metal legs. Hanging pod with a rocky past. Maffam’s Manu Nest Chair is a stylish cocoon made from basalt, a volcanic rock. Yarns spun from melting and extruding basalt are transformed into light and durable lacey hanging shells suitable for indoor or outdoor use. 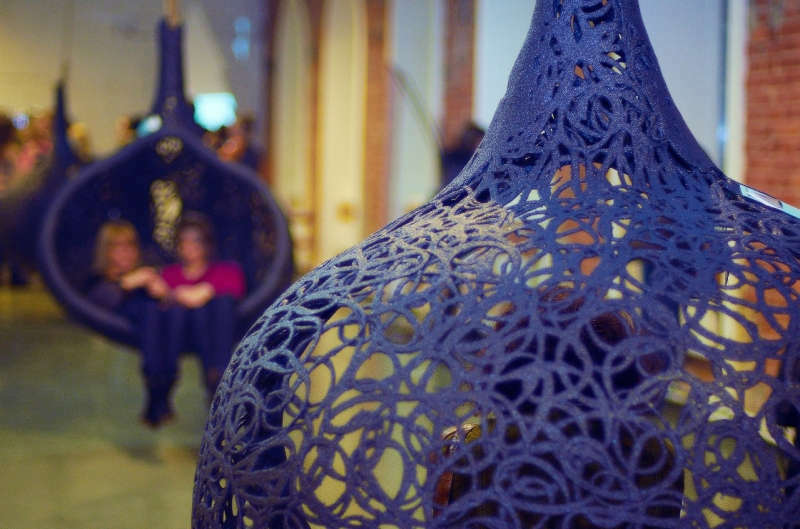 Whether you want to chill out inside the house or meditate in the great outdoors, this hanging chair will make it fun. 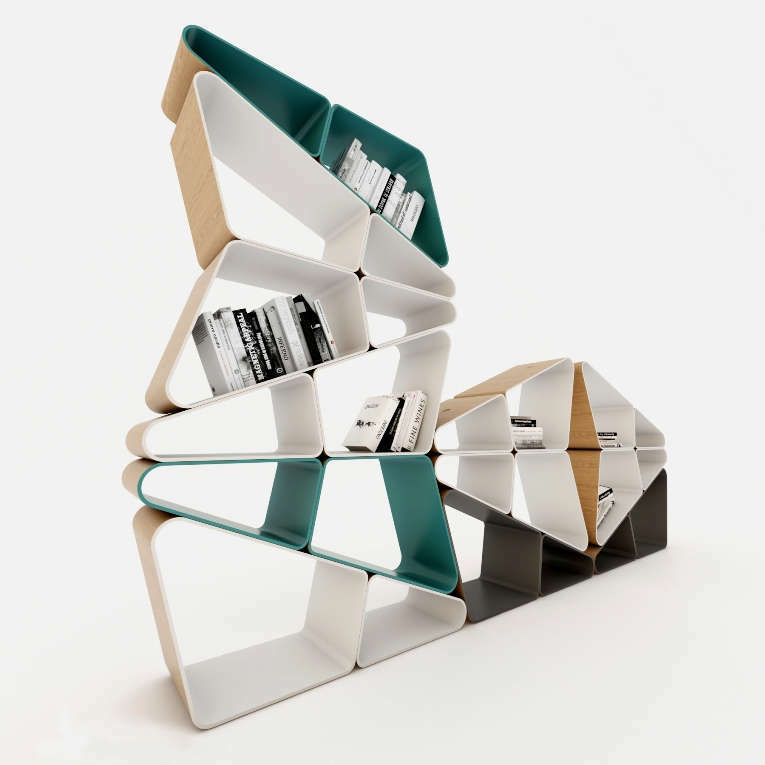 This award-winning book case by Selami Gündüzeri is highly modular. The components can be stacked in various combinations to create dynamic partitions in any home or library. The colors & finishes add an additional graphic element to the book case. While the book cases look quite unstable, they are actually secured vertically by round magnets hidden between the tops and bottoms of adjacent surfaces. An chair that can change colors with a blink of the eye. 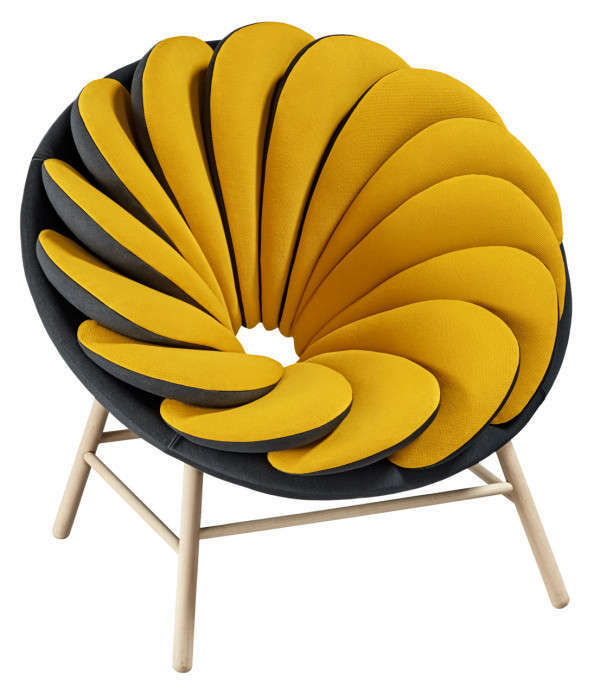 Furniture designer Marc Venot’s innovative Quetzel chair reminds me of a reversible jacket. Available in dark grey and bright yellow or navy blue and white, the 14 bi-color seat cushions can be flipped so the bottom cushion comes on top. Handmade in Valencia, Spain, these chairs will provide hours of entertainment for your children. Let’s hope the seat cushions hold up! 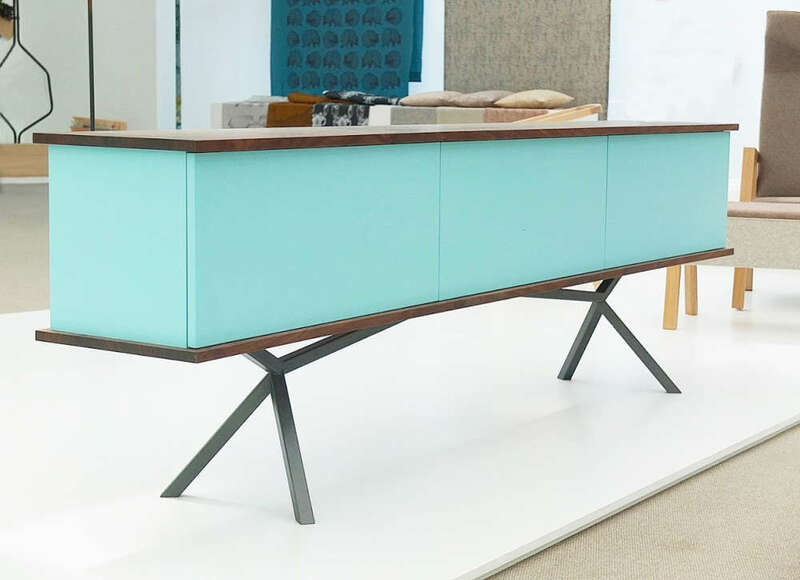 A sideboard with mid-century modern bent. Christian Kroepfl’s SB11 sideboard is elegantly understated but multi-functional. Designed as an entertainment center with headroom for upright vinyl storage, cable as well as ventilation management for AV equipment, it can also be configured for file folders or converted into a storage rack. Wood finishes in oak, walnut or ash and choice of lacquer colors are designed to complement any décor. 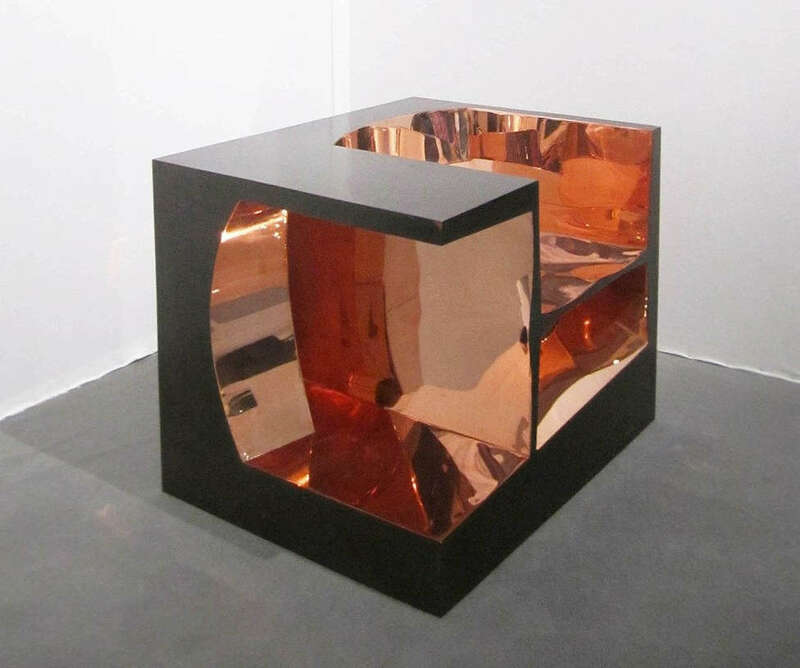 Is it a cube? Is it a chair?